The idea of focusing a Handel recital on the run of arias sung by one character is good. The likes of Cleopatra (Giulio Cesare) or Bajazet (Tamerlano) are given a progression of numbers, revealing rich and complex personalities, and sequencing them results in compelling quasi-cantatas. The emotional see-saws of the operas respond well to this treatment, but drama in the Christian oratorios comes more from meditation on constant attitudes. Thus in Theodora (1749) the heroine's visionary radiance is juxtaposed with Didymus's more energetic faith, both against the Roman consul's apoplectic fury. Lorraine Hunt Lieberson has made a profound impression on stage as Theodora�s confidante Irene, but can the character sustain dramatic interest over more than half an hour? The difficulty lies neither with the music nor the singer: Irene's arias are masterfully turned, and with the exception of the rather blank "Defend her Heav'n", inspiring in context. They also fit Hunt Lieberson's rich, noble mezzo like a glove. No, the problem is that five such dignified, beautiful and thoughtful meditations in a row are too much of a good thing. Mind you, no such difficulty should attend the chamber cantata La Lucrezia, a dramatic masterpiece from Handel's Italian years (c.1708). Recorded performances by Janet Baker (Philips 4264502 with Leppard) and Kozena (DG 469065 with Minkowski) ring the emotional changes on the wronged Roman lady to thrilling effect. 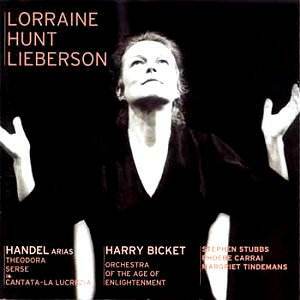 Hunt Lieberson offers an intensely serious, tonally consistent character who seems closer to Britten's dignified proto-martyr than Handel's excitably varied baroque portrait. As pure singing this is extremely lovely, but sensitively supported as it is by Bicket and his three fellow instrumentalists, the conception is a mite too monochrome, too staid for comfort. Two encores from Serse (1738) reinforce the feeling: Hunt Lieberson smoothes out the vertiginous contrasts of tempi in "Se bramate", but a fault there becomes a positive virtue for the ubiquitous "Ombra mai fù". Serse's love song to his favourite tree (did the Victorians realise?) is beautifully sustained, with just the right hint of emotional reserve. A satisfying conclusion, then, to an impeccably recorded and presented disc; but one which shows off the singer's vocal consistency better than her powers of characterisation.